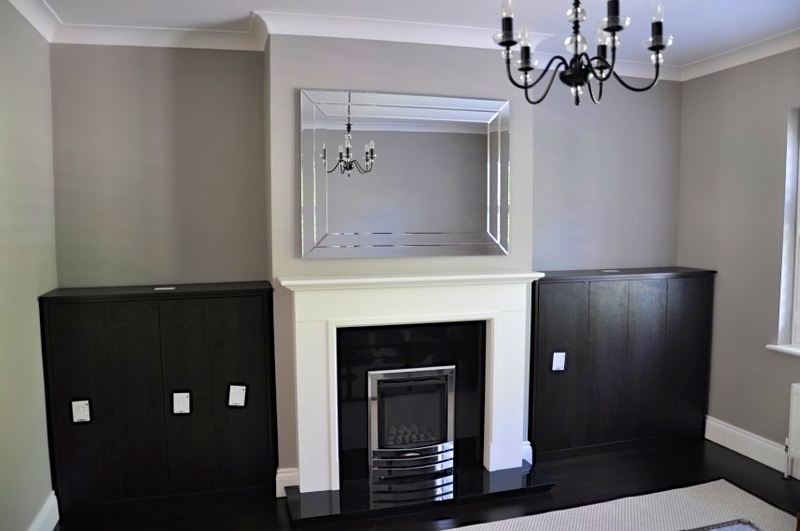 Designing and building your own fitted furniture is an exciting and intellectually engaging process – well it is in our world! The sequence of steps we describe as ‘straightforward’ rather than ‘easy’ as let’s face it any endeavour that produces a significant result will always throw up challenges. At DIY Wardrobes we have done everything we can to make no challenge insurmountable. Based on the experiences of hundreds of customer projects we can share with you this ‘excitement curve’ of what you might experience. 1 Need identified. 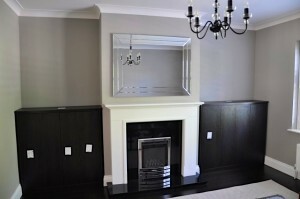 You need fitted furniture and have an inkling you’d like to be hands on if that was an option. Over to you. 2 I’ve found the DIY Wardrobes website! Yes this could work. 3 Uh oh, how do I get started. I’ll browse previous projects and try putting some numbers in the Cabinet Designer. 4 I’m getting the hang of this. 5 Yes, it’s definitely working. I’m going to make a few changes here and there with materials to adjust the budget. 6 Yep, I’ve created a design I’m happy with. I’m going to mull it over for a day or two. 7 Let’s go! Time to pay and commit to making this project happen. 8 Delivery day. There are so many pieces! How can there be so many? And they are heavy. I’m exhausted already! 9 I can see a chipboard core. Have I done the right thing? 10 Actually the show faces of the material look nice. Really nice. This edge banding stuff is thick. In fact comparing with other cabinetry in my house the quality is in a different league. 11 First screw driven. Ok, that wasn’t too bad. 12 First Cabinet assembled. This is looking good. 13 I love these hinges and drawer runners, really top notch engineering. 14 Smooth opening doors and everything lines up perfectly. Wow! 15 I’m really enjoying the detail and becoming a perfectionist which is funny because I’ve always thought of myself as an ideas person rather than a perfectionist! 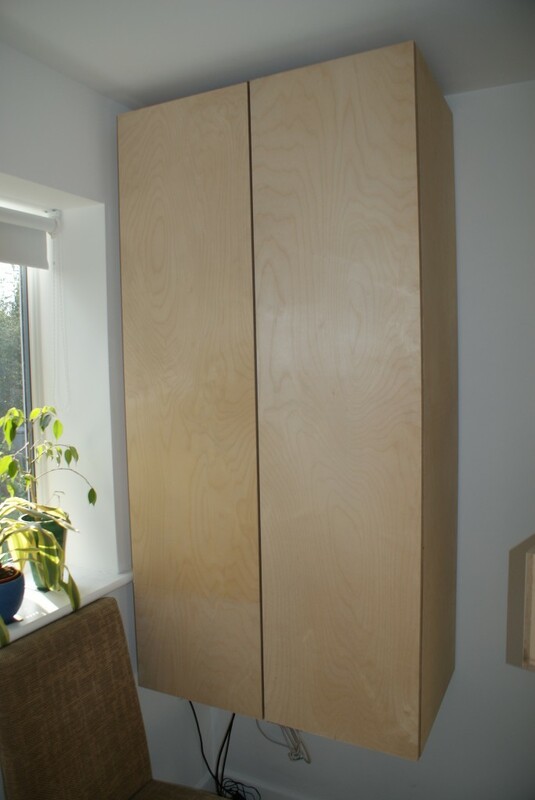 For the person who enjoys thinking through the detail and is prepared to work methodically DIY Wardrobes is the solution even if you don’t build things regularly or did so just once in the dim and distant past. Based on hundreds of previous projects we can assure you that the experience will be net positive, worthwhile and unique. If do any work from home you want your setup to be both ergonomic and compatible with your home life. 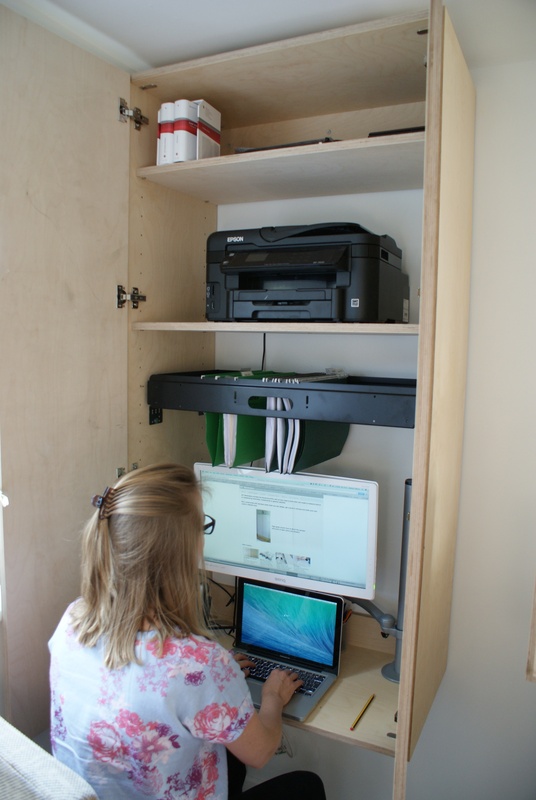 The ergonomics of office equipment such as the monitor arm and filing systems are good but in the setting of your home your either want them to be thoughtfully integrated or easily hidden away. That’s where this Birch Ply Home Office design suggestion homes in. – A monitor arm is attached to the cabinet bottom so that a 22inch monitor within the cabinet can be positioned at eye level. Our customers are savvy people and we regularly get designs drawn up in a variety of software packages. Often this is Autocad or Sketch-Up but we also get sent drawings made in Microsoft Word and Powerpoint. If your day job involves regular use of these software packages then why not use them to think out your furniture ideas? Although of course we believe our online design tools are far superior to Powerpoint for designing fitted furniture! If you would like to send us your Autocad/Sketch-Up/Word etc drawings then we request that you export the drawing as a PDF document from these packages. This avoids the pain of coping with different software package version numbers. When we receive your design we will then interpret it onto our own design tools. The reason we do this is that Autocad, for example, is CAD (Computer Aided Design) and what we do is CAM (Computer Aided Manufacture). CAD involves drawing a cabinet shape in the needed dimensions whereas CAM involves taking all the panels for that cabinet and generating a cutting list as well as a drilling plan for all the dowels, screws, shelf pins, skirting board notches, angles etc. In the side panel shown later there are over 50 holes/routing paths that the CAM process determines the positions for. And many of these holes must line up across panels so that for example the dowels that join the cabinet sides to the top are in the right place. 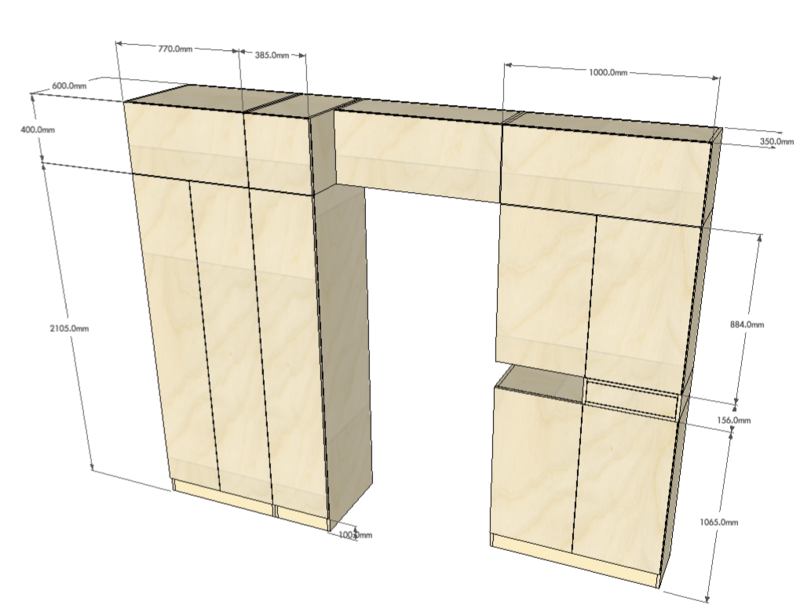 For the whole job there will be hundreds of holes needed – information that the Sketchup drawing simply does not contain. 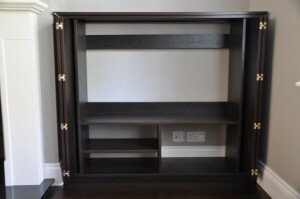 One of the unique features of the DIY Wardrobes service is that we can generate all this information mostly automatically which means that we can offer one off bespoke pieces in a scaleable and therefore affordable way. We generate the CAM files which are then sent electronically to the production machinery. Below is a Sketch Up drawing sent in by a customer and we’ll show the whole process through to finished installation. We’ve been able to interpret the design faithfully. This involved splitting the design into separate cabinets created with our ‘Cabinet Designer’ then on the order page there is a ‘Cabinet Combiner’ facility where we dragged the cabinets into position and took this screenshot. Now let’s look at the detail produced by our CAM system. 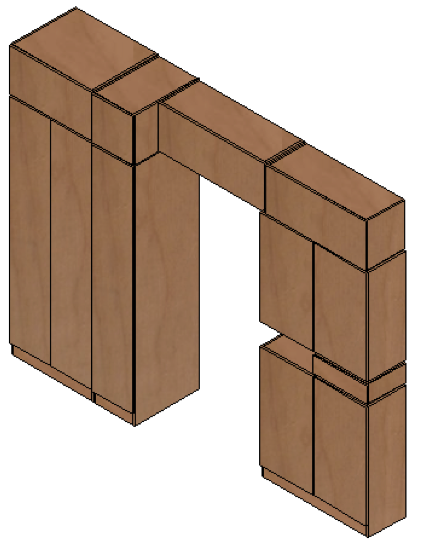 This diagram was produced by one of our applications behind the scenes at DIY Wardrobes and shows the machining positions for dowels, hinge plates, pilot holes and the notch for the skirting board. We’re showing this here for completeness but note that customers don’t need to get into this level of detail – well unless you really want to see it! This CAM information can be edited – e.g. adding cable cutouts is a popular request. All our applications are web-based so on occasion we have given access to customers who want to do something particular or special and they have edited the drilling/routing patterns themselves. Most of the time though just DIY Wardrobes staff work with this information. We wanted to share with you a process – working with a CAD drawing produced by the customer – we’ve engaged in many times and if this way of working suits you then go for it. – Parametric. 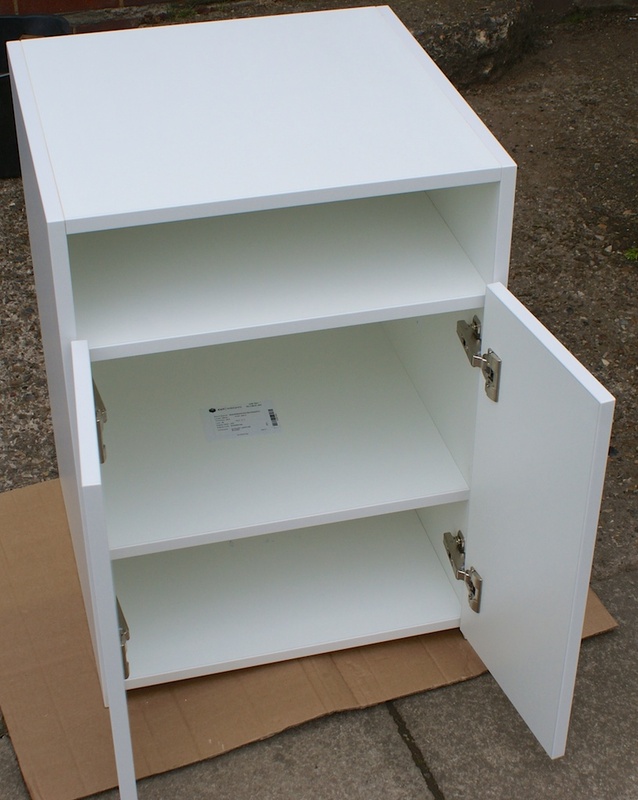 A cabinet has two sides, a top and a bottom. 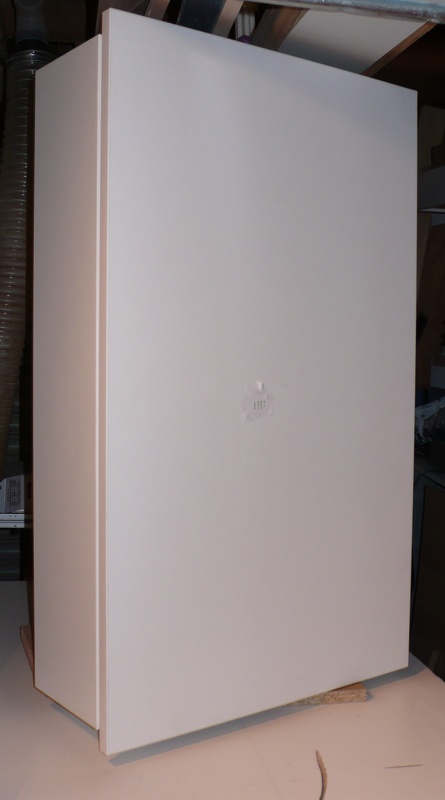 You might start with a cabinet 900mm high and then decide later you want it 1000mm high. Like a good CAD package everything will be stretched and moved accordingly without needing to individually manipulate each component. The position of shelves can be calculated to be spaced evenly automatically. – The design can be saved and iterated. Some customers work on a design for hours/days/weeks. You always want to be able to save what you’ve done and then come back and edit it. – Design options evaluated quickly. 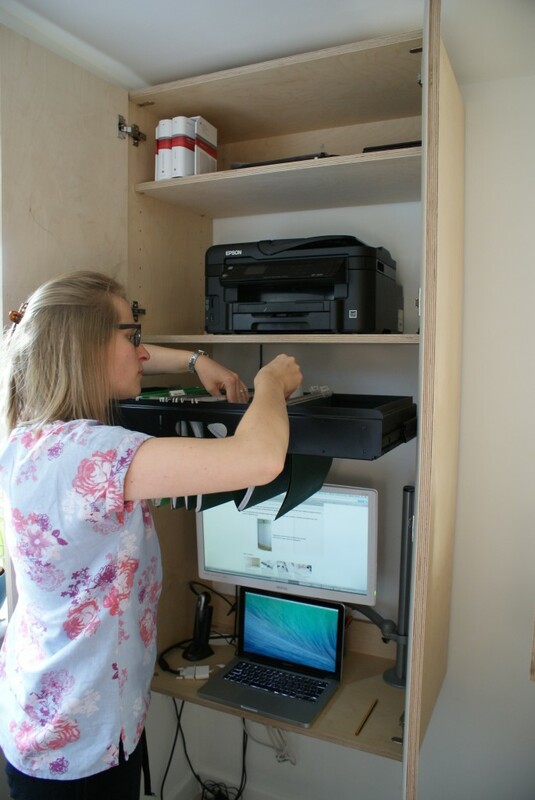 With the DIY Wardrobes ‘Cabinet Designer’ whether a cabinet has one door or two is a single mouse click. 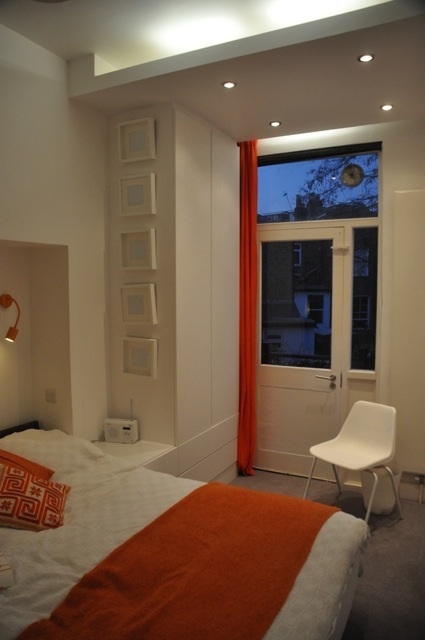 Where DIY Wardrobes offers a considerable advantage is that you get cost information as you are designing. 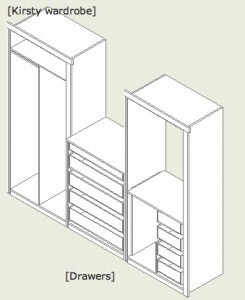 As you change sizes, materials, add drawers and shelves etc the cost for the design is calculated automatically. Start designing now on the DIY Wardrobes website. 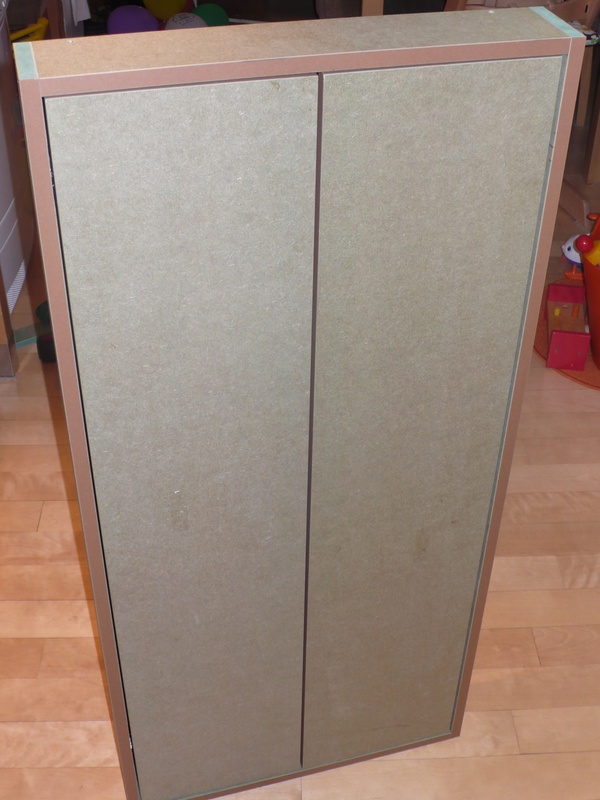 Sometimes we get enquiries where the customer says they would like a material other than Melamine Faced Chipboard (MFC). That’s fine as we have real wood veneered MDF, Birch Ply and primed MDF as other options. Invariably the aversion to MFC is because the customer has had a bad experience with MFC furniture/kitchens in the past. These experiences are well grounded but all the issues have been solved many years ago for those manufacturers – like us – who have chosen to use the solutions. Here’s a run through of the issues and how they have been solved at the quality end of the market. First of all you need to start with a high quality manufacturer such as Egger or Kronospan. The surface quality of these products is excellent with some of the wood grain effects being almost indistinguishable from real wood. The laminate is thicker and well bonded. The weaker area for any MFC board are the edges. The solution to prevent chipping is to edge band the edges with 2mm thick ABS plastic. 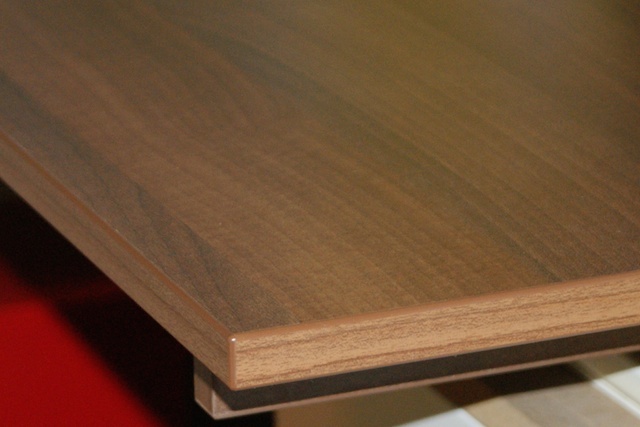 The norm for the kitchen industry has been to use 0.4mm thick melamine edging and the move is now towards 1mm thick edging. However quality manufacturers have been using 2mm thick edging for years. 2mm thick edging is very difficult to damage. Because it is ABS plastic it can take knocks and has sufficient give to avoid damage. 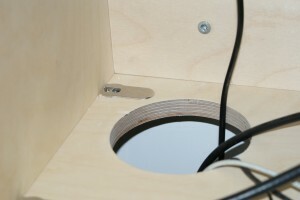 MFC doesn’t hold screws as well as solid Oak for example. 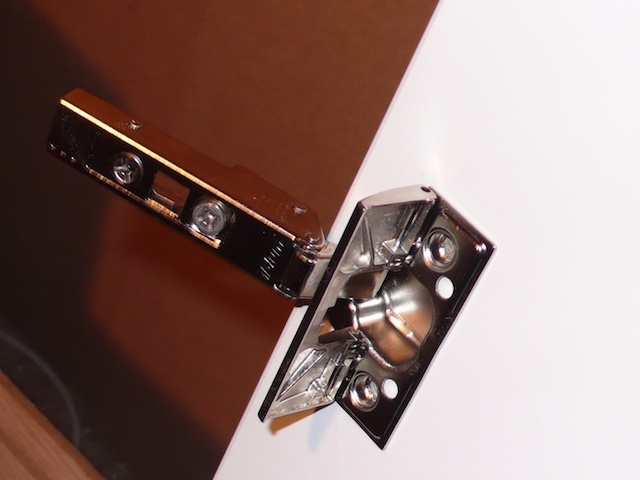 The solution is to use the latest high-tech screws for joining the carcass and to use hinge fittings without screws. Screws hold in wood based products by cutting a thread. In solid wood the wood fibres are held tightly together, particularly in hardwoods like Oak. In MFC and MDF inter-wood fibre strength does not exist so we’re relying on the binders that hold the particles together. For short screws in particular any stresses on the screw (opening and closing a door for example) could eventually lead to it ripping out. The solution is rather than relying on cutting a thread in MFC instead rely on its resistance to compression forces. 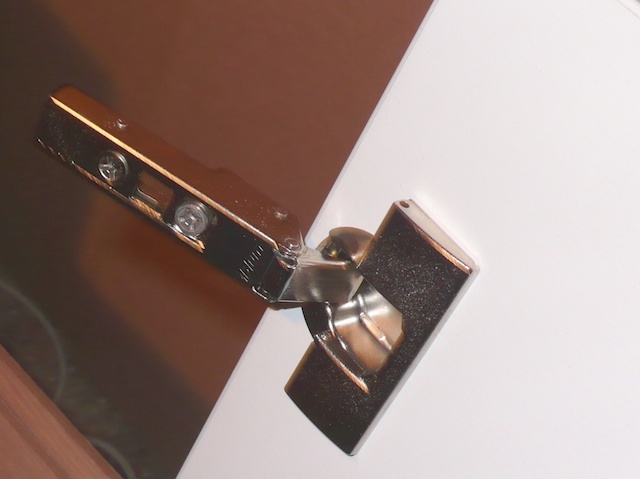 For hinges we use Blum INSERTA which feature an expanding boss that activates when the flap is closed. 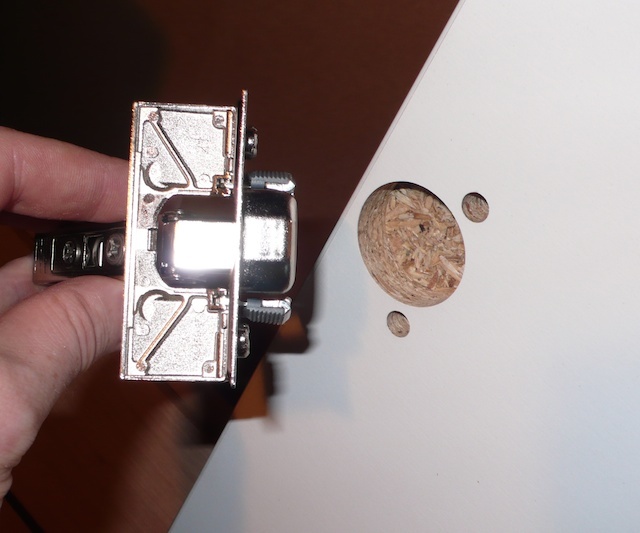 For hinge plates to connect to the carcass we use Blum Expando which features a 5mm diameter split dowel. As the fixing screw is driven in the split dowel expands. Because these pieces of hardware rely on compression they are much harder to pull out of MFC material. There was a time when the industry standard was 18mm thick for kitchens and 15mm thick for bedroom furniture. Quality manufacturers always use 18mm and avoid long material spans that could sag. An 18mm thick back panel keeps the carcass square and rigid. Modern board manufacturing techniques have increased the finesse of the finished MFC. Egger for example produce boards in over seven different textures from ‘matt’ to ‘gloss’. Cheaper MFC could have bits of debris – screws etc – in it but the MFC we use only has quality graded chips and binder. The reason being that when we process with automated machinery, the saw blades and cutters can cost several hundred pounds each and we don’t want them damaged by cutting a foreign object within the MFC! You may have seen water damaged cheap MFC where it starts to swell and pieces break off e.g the bottom of cheap kitchens. Well not the MFC we use! As a test we’ve left offcuts of Egger MFC outside exposed to the elements for a couple of weeks. Some swelling was evident but the offcuts were still serviceable (by the way we don’t leave customer orders out in the rain but if you took delivery of an order and for some reason left it out in the rain for several hours it wouldn’t be a problem). MFC is one of the most sustainable wood based products. The bulk of the wood chips in MFC come from trees grown in managed forests. And because the trees are chipped there is very little wastage. Quality MFC is manufactured in the UK and is FSC certified. FSC stands for Forest Stewardship Council and guarantees that the product is made with wood only from sustainable sources. Just for comparison solid hardwood furniture on sale in the UK will almost certainly NOT be FSC (ask the retailer for the certificate!) and will have been manufactured in the far east. All of the MFC we use is FSC certified as are all the wood based products we use, down to an individual dowel. The title of this article is slightly contradictory but when designing your own made to measure furniture you need to start from somewhere! We present some de facto standard size ranges for various elements in built-in furniture and you can use these as a starting point. 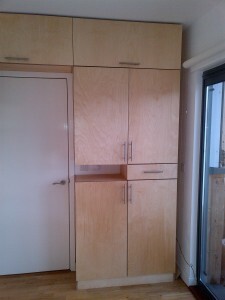 Note on terminology: a built-in wardrobe comprises one or more cabinets. The recommended sizes are for the cabinets. Built-in made to measure wardrobes are usually designed to be floor to ceiling to take advantage of the available space. In UK homes this tends to be around 2400mm. People lucky enough to live in grand proportioned Victorian/Georgian homes can have floor to ceiling heights of 2500mm plus. – ceilings are often bowed. This could be due to the plasterboard sagging under its own weight or an overladen loft. Either way planning in some free space is a good idea. This space can be covered by a scribe piece strip. 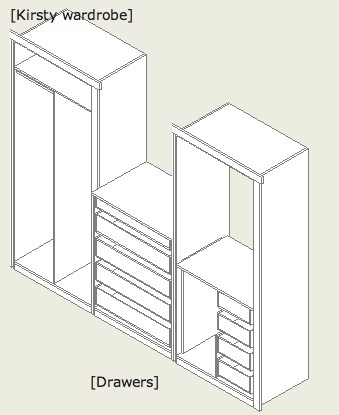 For a 2400mm floor to ceiling measurement, designing a wardrobe 2350mm high is recommended. – factor in headroom to enable easy assembly. Generally the easiest way to assemble a wardrobe is when it is lying horizontally on the floor then rotate it to vertical and slide into position. To ensure there is vertical space for the rotation the diagonal measurement of the wardrobe side pieces should be less than the available floor to ceiling space. 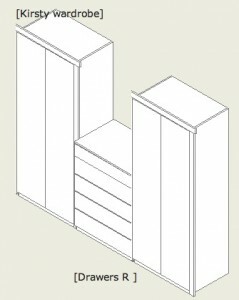 As an example, a 2350mm high and 500mm deep cabinet will require a vertical space of 2402mm to rotate from horizontal to vertical. If you don’t have the space to rotate the wardrobe you can build in the vertical. 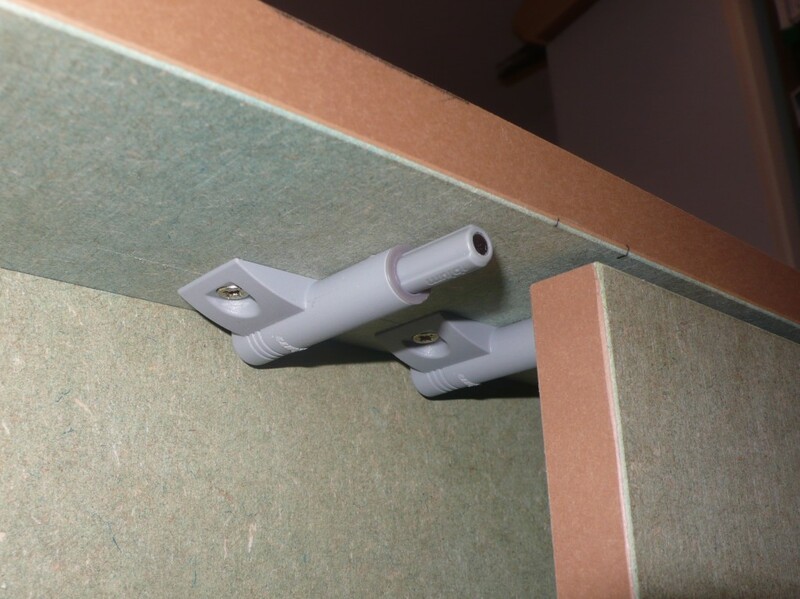 We pre-drill our wardrobe kits for dowels so the dowels keep the panels (the top/bottom and sides) registered in the correct place and assembly is a case of securing with screws. In this case it is making sure there is enough space for the body of the drill. If there is not enough space for the body of a drill then the next option is to specify ‘Rafix’ fixings so that the panels can be tightened with the turn of the screw in the fixing. 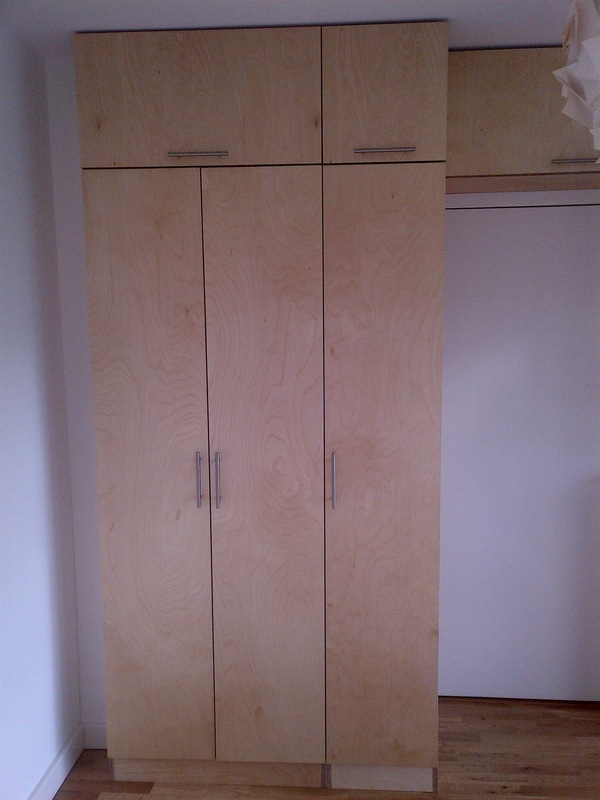 Firstly if you need a wardrobe greater than 1500mm this would be composed of several cabinets butted together. For example a 3metre wide wardrobe could be composed of three 1000mm wide two door cabinets. 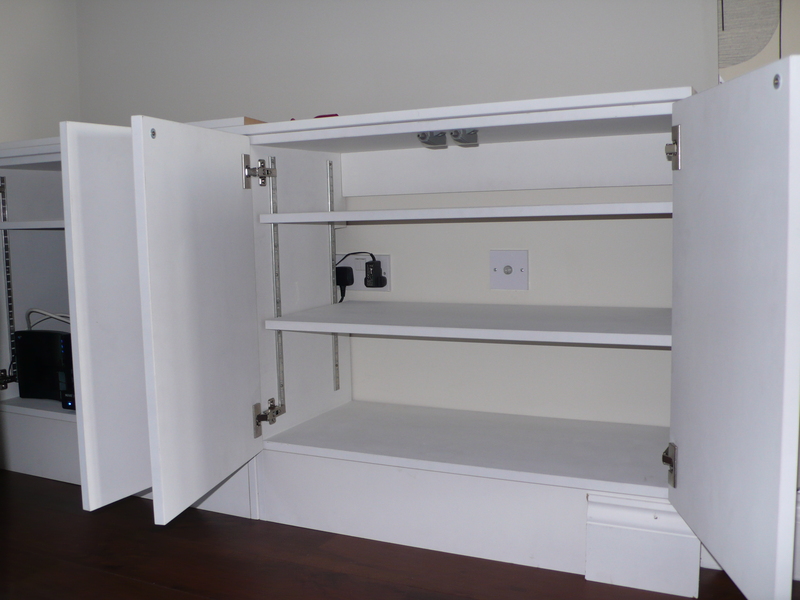 The maximum width for an individual cabinet is dictated by door width and shelf span. 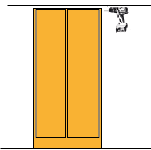 The recommended maximum door width for an hinged door is 750mm. This is a technical limit due to the weight of the door acting on the hinges. Also bear in mind that a wider door will require a wider space in front so that it can open fully. 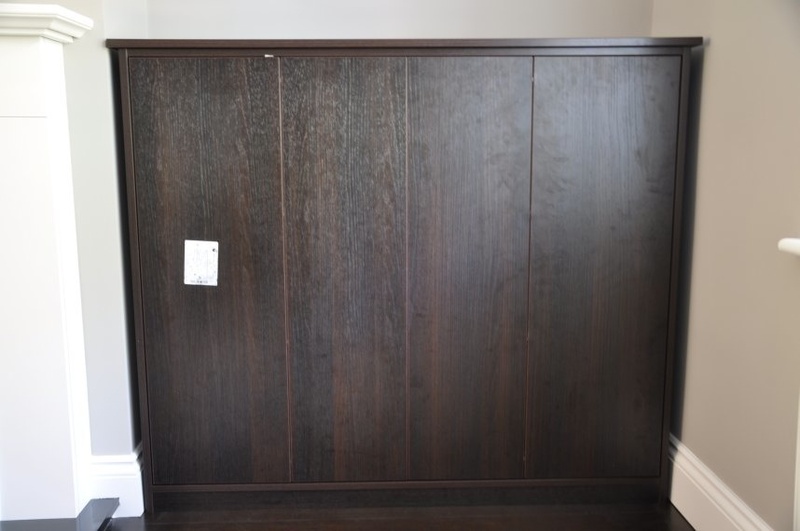 For example the closest position of a bed in front of a cabinet with 600mm wide doors would be 600mm which is why in some bedroom configurations the only cabinet possibility is one with sliding doors. In practice realistic door widths are in the range 350mm to 550mm. Shelves ideally should be less than 1000mm long as longer than this without some kind of reinforcement introduces the risk of sagging. 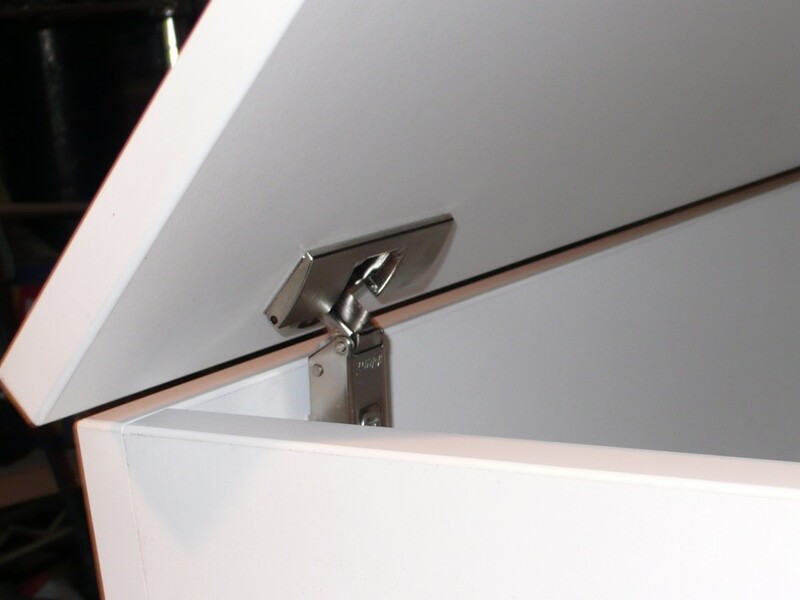 Drawers don’t have the sagging risk since they are based around a rigid drawer box. With the high quality drawer runners we use we are yet to encounter to a design with a drawer that is too wide and regularly see designs withe 1000mm wide drawers. The limiting factors here are ergonomics. Too shallow (less than 300mm) and you can’t store much; too deep (more than 800mm) and your arm is not long enough to reach the cabinet contents! On diywardrobes.co.uk we have a variable called ‘Bottom position’ which dictates whether there is a plinth or not and its size. Ideally a cabinet should be off the floor, whether it incorporates its own plinth or it is mounted on a separate plinth. 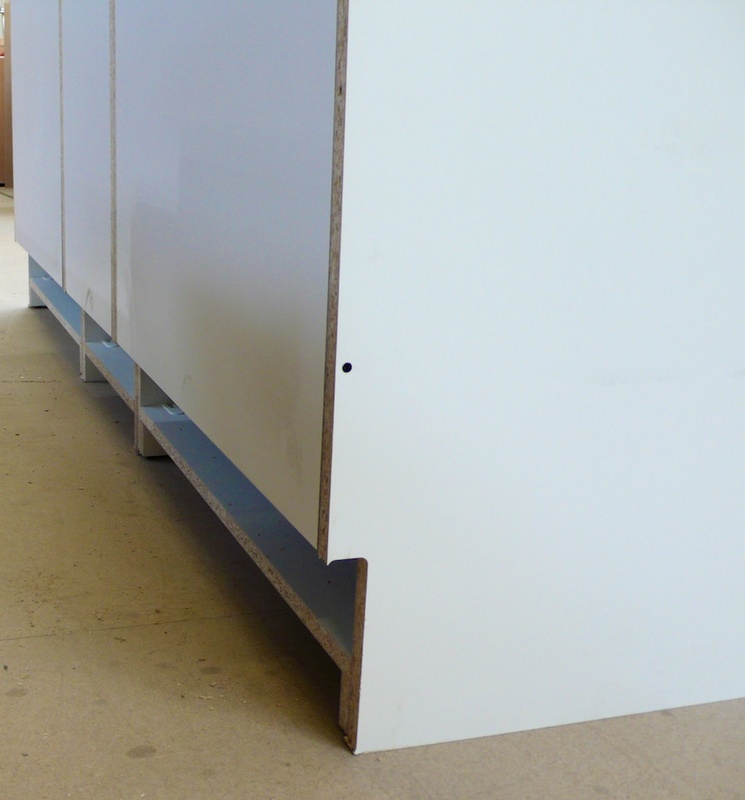 Without a plinth the doors/drawers risk binding on the floor as they are opened. 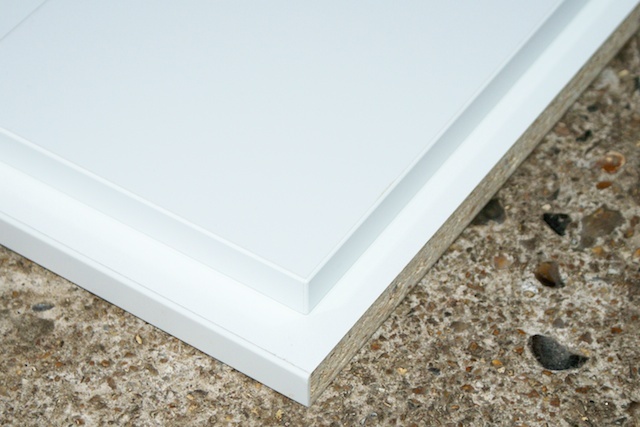 By default doors have a clearance of 2.5mm below them but if the floor is uneven or the cabinet sits on carpet then the binding risk is high. 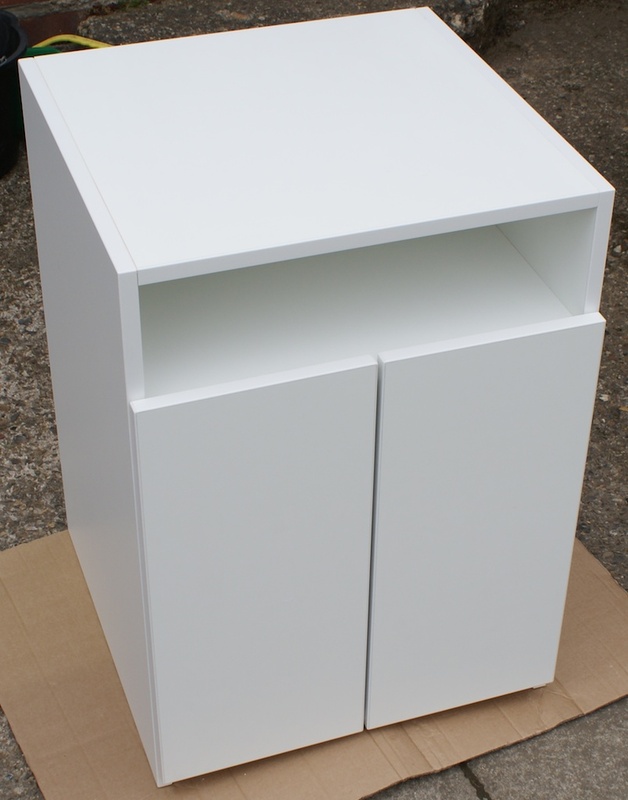 Kitchen cabinets usually sit on adjustable legs in the height range 100-150mm and the plinth is attached to the front of those legs. Bedroom/home office furniture doesn’t need such a high plinth and 50mm is a good start. – to avoid the need to remove skirting in the room design the cabinets with a bottom position above the existing skirting or specify a ‘skirting notch’ in our Cabinet Designer. The ‘Bottom Position’ and ‘Skirting notch height’ parameters can be different in the Cabinet Designer. 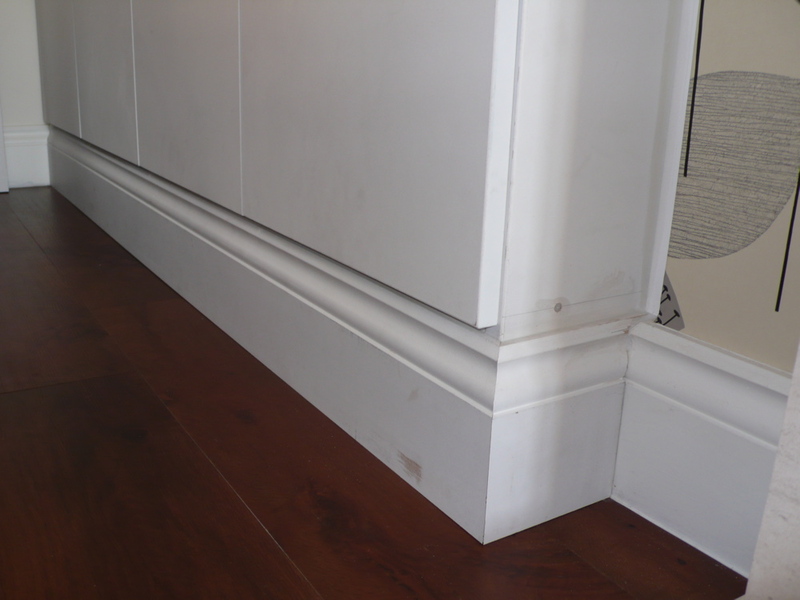 Here for example the Bottom Position is 50mm giving a plinth height of 50mm and the skirting notch is 150mm to ride above the existing skirting in the room. – set the bottom position above the skirting height and then run matching skirting across the plinth space to achieve a high quality built-in effect. Clara in St. Albans designed these stunning alcove cupboards with bi-fold doors (see soss hinges in picture below) and pocket doors. Material is black/brown ferrara oak melamine faced chipboard. 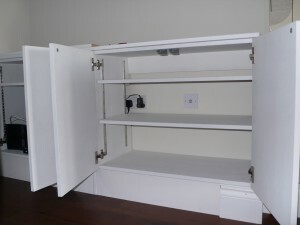 Pictures show cupboards shortly after installation by customer, no handles on yet. Kirsty and Mark in south-east London designed this built-in wardrobe for their bedroom. The material was primed in our factory and the customers then applied their choice of top coat. 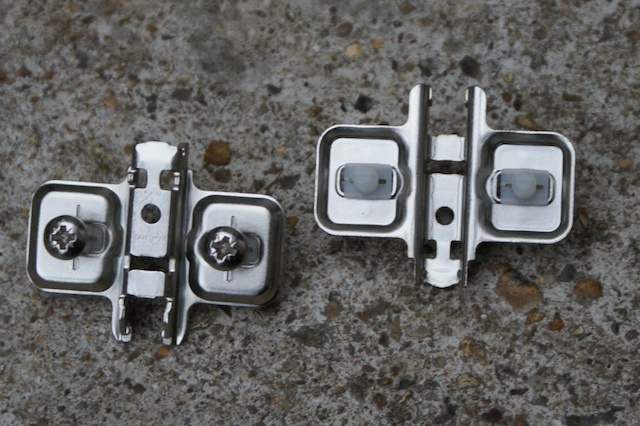 Scribe pieces were supplied by us so it could all be build in. 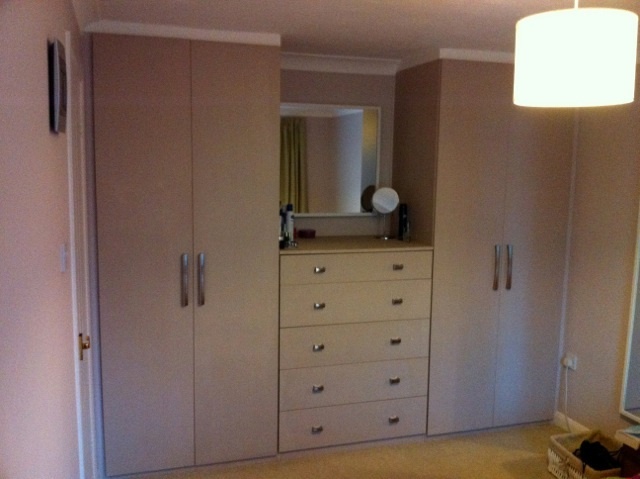 Mark in London designed these opposing wardrobes with the use of our system. 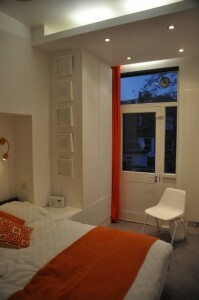 He opted for white painted mdf material for the wardrobes to blend in nicely with the rest of the bedroom design. 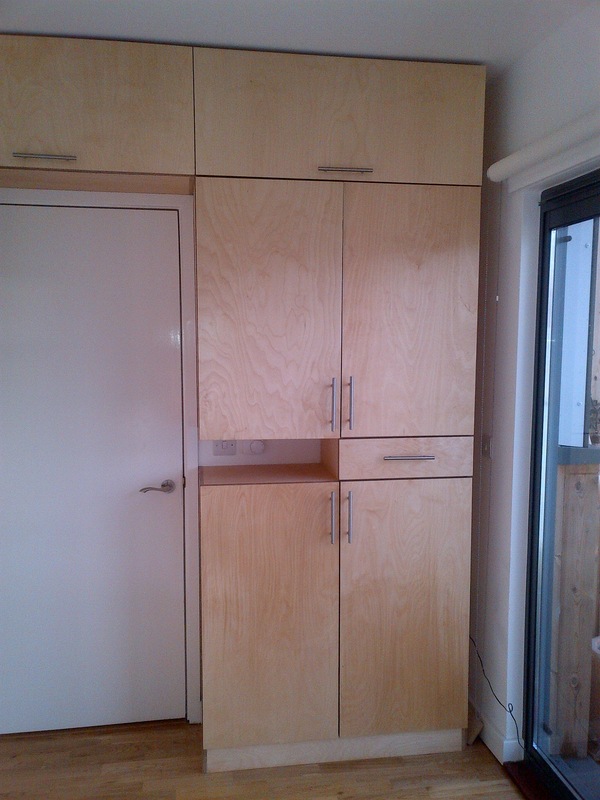 Doors and drawers are handleless, with push to open mechanism. 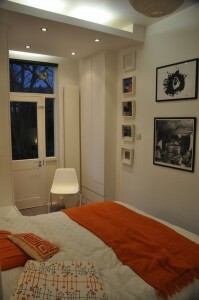 Pictures above showing living room cupboards designed by Harriet in south-east London. 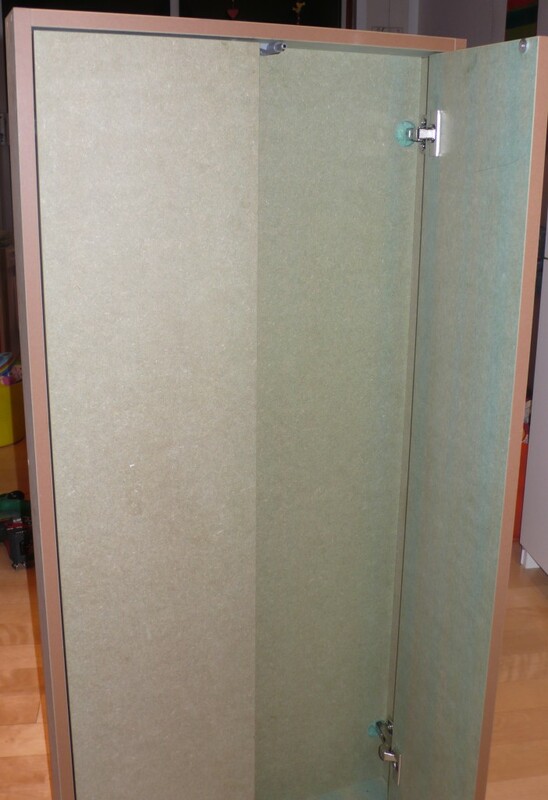 Customer in Gloucestershire used moisture resistant mdf with tip-on mechanism for the bathroom cabinet shown below.